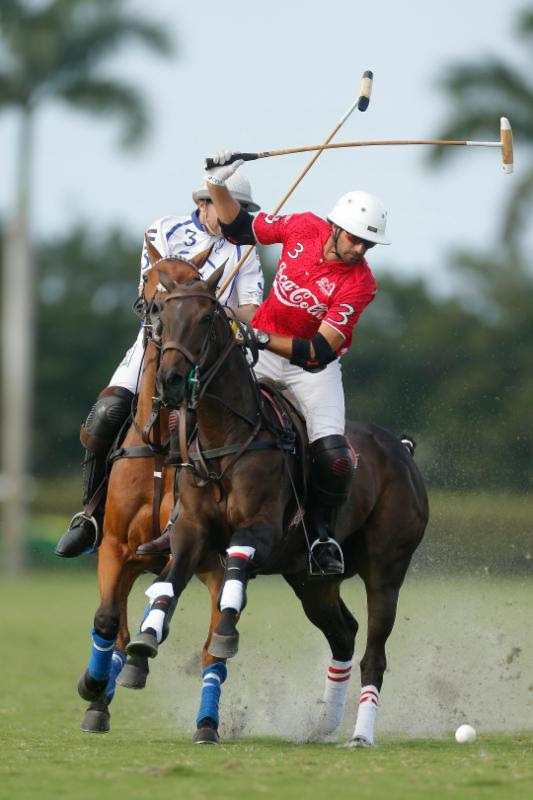 WELLINGTON, Fla. – February 27, 2017 – Coming in from last week’s overtime loss to Orchard Hill, Coca-Cola was in for a tough test Sunday against Valiente on Engel & Völkers field at the International Polo Club Palm Beach (IPC). 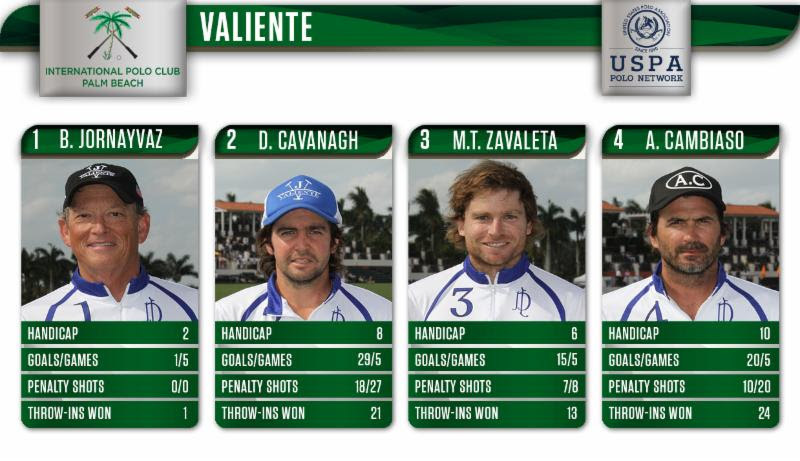 Making their debut in the 26-goal C.V. Whitney Cup, Valiente stole the day 12-3. 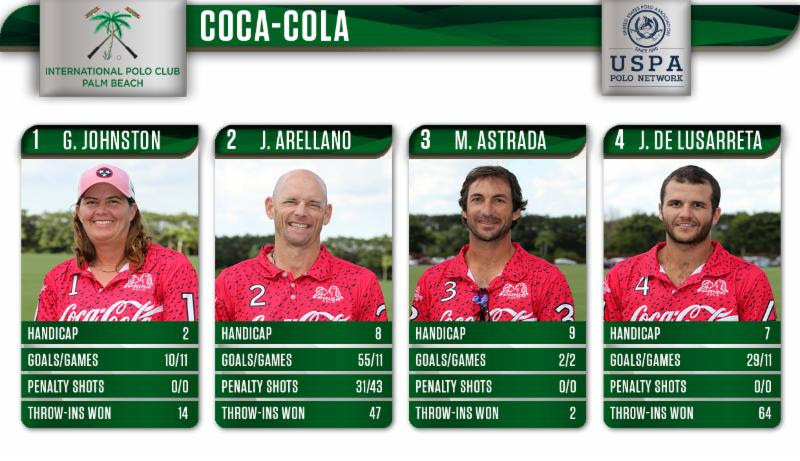 A new Valiente lineup featuring patron Bob Jornayvaz, Matias Torres Zavaleta, Diego Cavanagh and Adolfo Cambiaso put in a command performance against Coca-Cola. 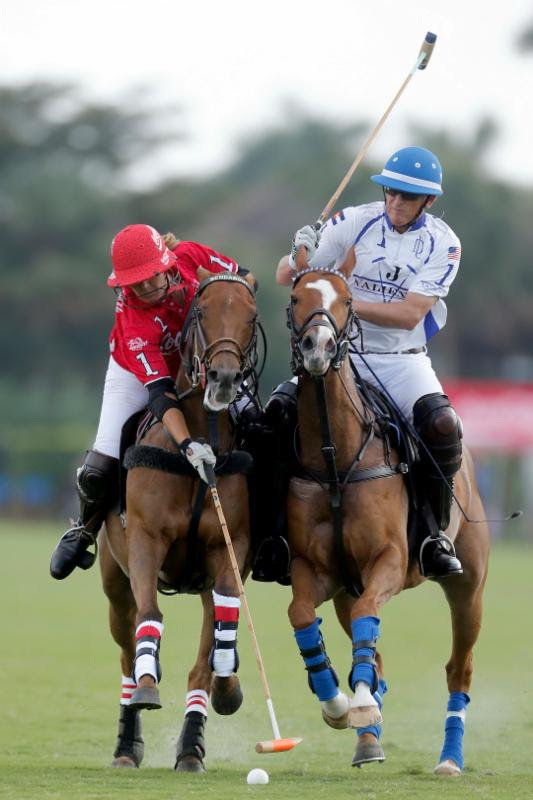 In a true team effort, Valiente had their opponents on the defense the entire game. Valiente scored early, with Cavanagh converting a penalty attempt to put his team up 1-0. Cavanagh was the designated penalty-taker throughout the game, a plan that worked for Valiente. While Cambiaso has long been the presumptive penalty shooter, the choice of Cavanagh was not surprising, given the records of the two players this season. 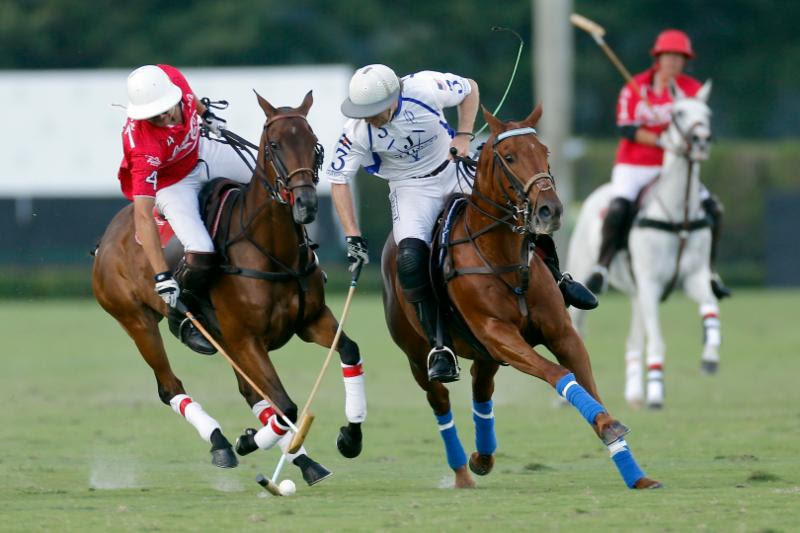 In the Ylvisaker, Cambiaso struggled from the penalty line shooting 9/19 (47%) for Valiente 1, while Cavanagh, playing for Valiente 2, was 13 of 19 (68%). 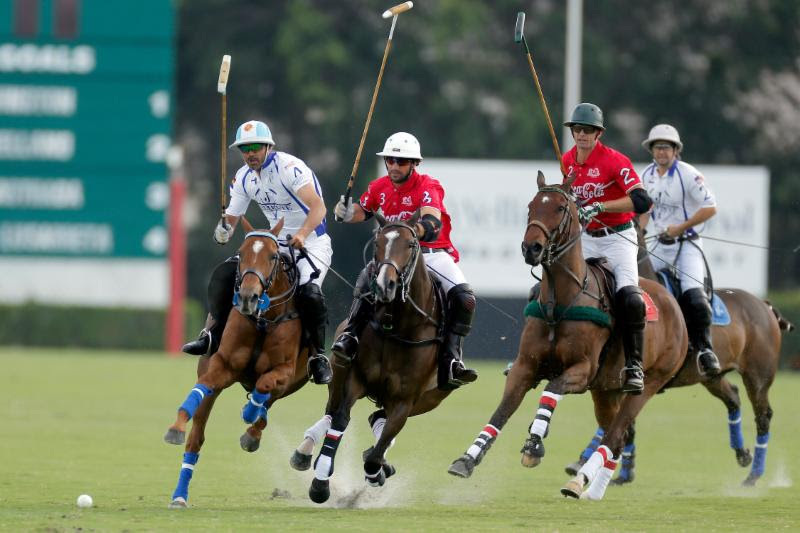 As the two players came together for the 26-goal, Valiente chose to go with the percentages and had Cavanagh take penalty shots throughout the game. As play progressed, it was clear that Valiente’s strategy was to allow Cambiaso to manage play from the back, with Cavanagh working hard to block any Coca-Cola defender who tried to pressure the ball. That became very effective, as the extra time for Cambiaso gave him the ability to work in open space and find Zavaleta releasing down field. The setup allowed Zavaleta to shoot at goal 3 times in the opening half, converting twice for goals. Meanwhile, Cambiaso and Cavanagh only shot at goal once each, displaying their ability to impact the game with ball control and passing, rather than making attacking runs themselves. While Valiente used a similar strategy in the 20-goal, it seemed to be more effective in 26-goal with 6- and 8-goal players in Zavaleta and Cavanagh, respectively, receiving the passes. Zavaleta has shot 61.5% from the field while Cavanagh has shot 55%, both well above the 2017 season average of 47.6%, allowing Cambiaso to distribute offense rather than generate it himself. 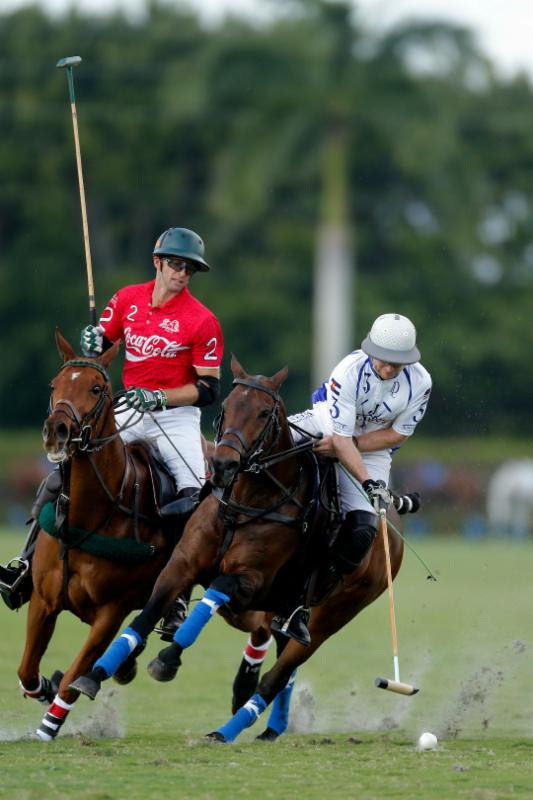 Valiente was relentless, stretching their lead to 7-1 after the first half with Cavanagh shooting 4 of 6 from the penalty line, Zavaleta adding two goals from the field and Cambiaso adding one goal from the field on his only shot attempt. Coca-Cola struggled to keep consistent possession, only putting 6 shots at goal with Julian de Lusarreta their only player to score a goal. Throughout the game, Coca-Cola tried desperately to pressure Cambiaso when he had the ball, often bringing de Lusarreta and Julio Arellano forward. But that allowed Cambiaso to pass into space and enabled Jornayvaz to block downfield for Zavaleta and Cavanagh as they received the pass. That put a lot of pressure on Miguel Novillo Astrada to stay back and never allowed him to push forward in the game. Astrada only managed one shot and zero goals for the game as the Valiente offense kept the 9-goaler in check. 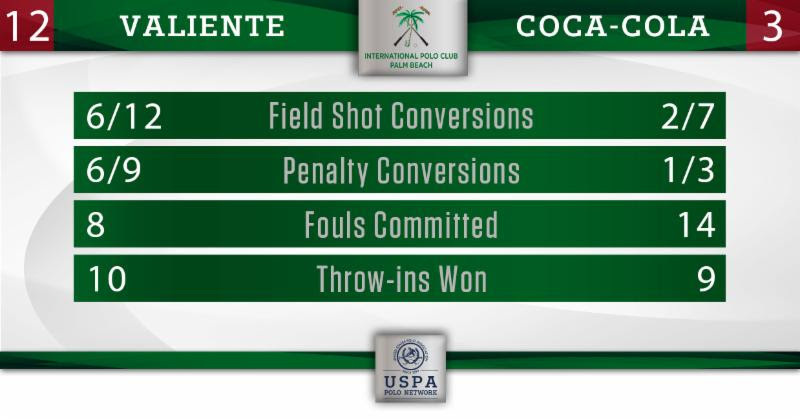 With Coca-Cola often on the defense, they ended up committing 14 fouls to Valiente’s 8 for the game. The team in red never could make a consistent attack from the field or from Arellano at the penalty line, as he was only given 3 attempts all game.